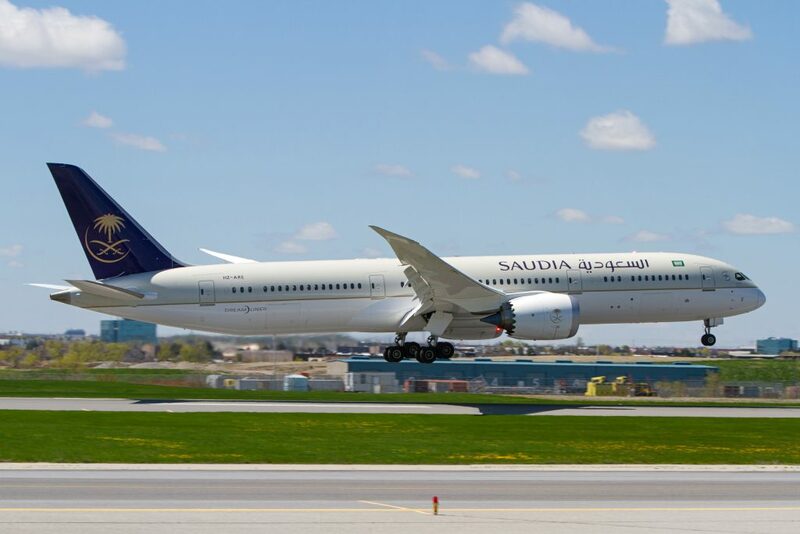 Saudi Arabia's state airline has suspended its direct flights to Toronto after Canada called for the release of detained activists for civil society and women's rights. Saudi Arabia has frozen all trade and expelled Canada's ambassador over what it called interference. Canada has responded by saying it will continue to advocate for human rights. Canada's Foreign Affairs Minister Chrystia Freeland said she was deeply concerned by the diplomat's expulsion, but added Canada will always stand up for the protection of human rights, including women's rights and freedom of expression around the world. We will never hesitate to promote these values and we believe that this dialogue is critical to international diplomacy. Her Saudi counterpart, Adel al-Jubeir, had earlier tweeted that Canada's position was based on misleading information, adding that anyone arrested was subject to Saudi laws that guarantee their rights. The leading Saudi women's rights campaigner Manal al-Sharif thanked Canada for speaking up and asked when other Western powers would do the same. The image was overlaid with text, including a quote which read he who with what doesn't concern him finds what doesn't please him. Last Tuesday, the Office of the UN High Commissioner for Human Rights said at least 15 human rights defenders and women's rights activists critical of the Saudi government had been arrested or detained arbitrarily since 15 May. Eight of them are believed to have been released pending procedural reviews, but the whereabouts of several others are unknown. Several of those detained have been accused of serious crimes, including suspicious contact with foreign parties, and could face up to 20 years in prison. Human rights groups reported that Ms Badawi was also detained last week, along with fellow women's rights campaigner Nassima al-Sadah. Ms Badawi was given the US International Women of Courage Award in 2012 and is known for challenging Saudi Arabia's male guardianship system. Her brother Raif was sentenced to 10 years in prison and 1,000 lashes for insulting Islam online back in 2014, while his wife, Ensaf Haidar, lives in Canada and recently became a Canadian citizen. Foreign Minister Chrystia Freeland wrote on Twitter on Thursday that she was very alarmed to learn that Ms Badawi had been detained. The next day, the Canadian foreign ministry called for the activist's immediate release. The Saudi foreign ministry statement expressed disbelief at this negative unfounded comment which was not based on any accurate or true information. It insisted the activists were being detained lawfully and that the Canadian statements represented blatant interference in the kingdom's domestic affairs. The ministry recalled its ambassador to Canada for consultations and declared the Canadian ambassador persona non grata, giving him 24 hours to leave. Saudi Arabia would also put on hold all new business and investment transactions with Canada while retaining its right to take further action, it said. Trade between the two countries was worth $3bn (£2.3bn) in 2016. All scholarships enabling Saudi students to study in Canada were also suspended, while students already in the country will be relocated. It is unclear how many people this will affect. The Vancouver Sun said in 2015 that about 5,000 new students arrive from Saudi Arabia each year. On Monday, speaking to reporters in Vancouver, Freeland said Canada is very comfortable with its position that led to the new measures announced by Saudi Arabia. We are always going to speak up for human rights, we are always going to speak up for women’s rights and that is not going to change. Freeland said Canadians expect its foreign policy to be driven by Canadian values. According to a report out of Riyadh from Saudi-owned media outlet Al Arabiya, training, scholarships and fellowships for Saudi students in Canada are being shelved. I’m concerned about those students, but we still need to stand by our position that we support human rights in the world, Bessma Momani, an expert on Middle East issues and a political science professor at the University of Waterloo, said in an interview Monday. I don’t think, understanding Saudi Arabia’s foreign policy, that they’re going to climb down from this, so we’re at an impasse. In a tweet Monday, Momani said in part that the affected Saudi students are now scrambling with what to do with their lives. Unjust! They’re supposed to be here in three weeks to start school, so it’s devastating when you think of it that way, she said. She says the Saudi government is trying to make an example out of Canada by showing the world it doesn’t take comments critical of domestic Saudi affairs lightly, especially on human rights matters. While we await further information, our immediate focus will be on supporting these students to understand the potential implications for them, Joy said in an emailed statement. The news comes after Saudi Arabia’s decision Sunday ordering Dennis Horak, Canada’s ambassador to Saudi Arabia, out of their country in 24 hours. The Saudis are recalling their ambassador here in Canada as well. As part of those moves, new trade and investment transactions between Canada and Saudi Arabia have been frozen. Saudi Arabia provides about 10 per cent of Canada’s imported crude oil and Canada’s largest export recently has been armoured tanks and personnel carriers. General Dynamics Land Systems in London Ont., inked a $15-billion deal four years ago with the Saudis to provide that country with light-armoured vehicles. The dispute was sparked by tweets in which Canadian officials demanded the Saudis immediately release women’s rights activists being detained in the kingdom, including Samar Badawi. Her brother, Raif, was arrested in 2012 and sentenced to 10 years in prison and 1,000 lashes for insulting Islam in his blogging. Very alarmed to learn that Samar Badawi, Raif Badawi’s sister, has been imprisoned in Saudi Arabia. Canada stands together with the Badawi family in this difficult time, and we continue to strongly call for the release of both Raif and Samar Badawi, Freeland tweeted Thursday. Freeland issued a statement Monday in response to the expulsion of the Canadian ambassador. We are deeply concerned that Saudi Arabia has expelled Canada’s ambassador in response to Canadian statements in defence of human rights activists detained in the kingdom. Canada will always stand up for the protection of human rights, including women’s rights and freedom of expression around the world. We will never hesitate to promote these values and we believe that this dialogue is critical to international diplomacy. Freeland said the Canadian embassy in Riyadh, continues its regular operations, including consular services. She added it’s premature to comment on the status of Canada’s arms deal with Saudi Arabia or the economic consequences of the move, adding she’s waiting for more specifics from the country.